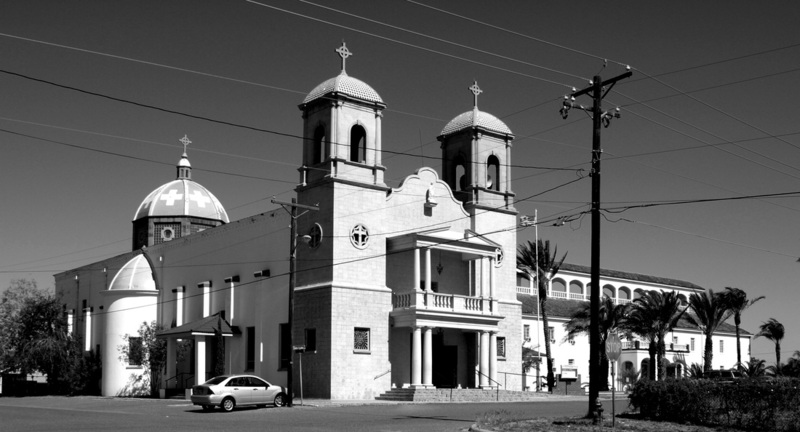 "Because of its location away from the coast and primary trade routes, the future county was not immediately settled by the Spanish. 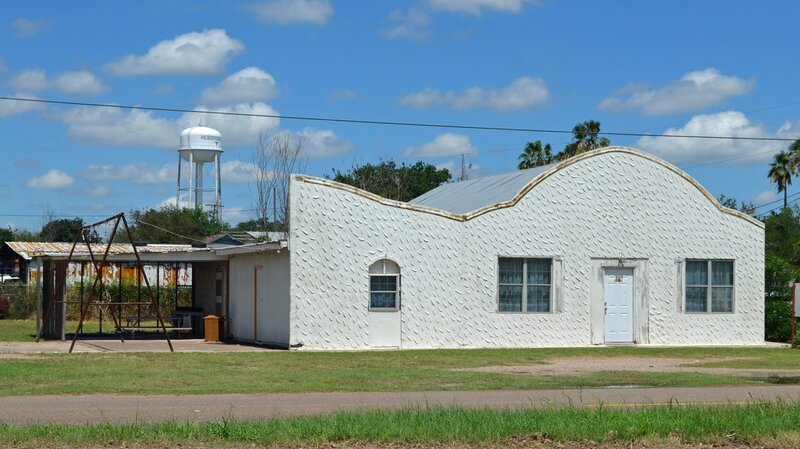 Although land grants in the Trans-Nueces region were made as early as 1767, not until the early 1800s was an effort made to settle the area. 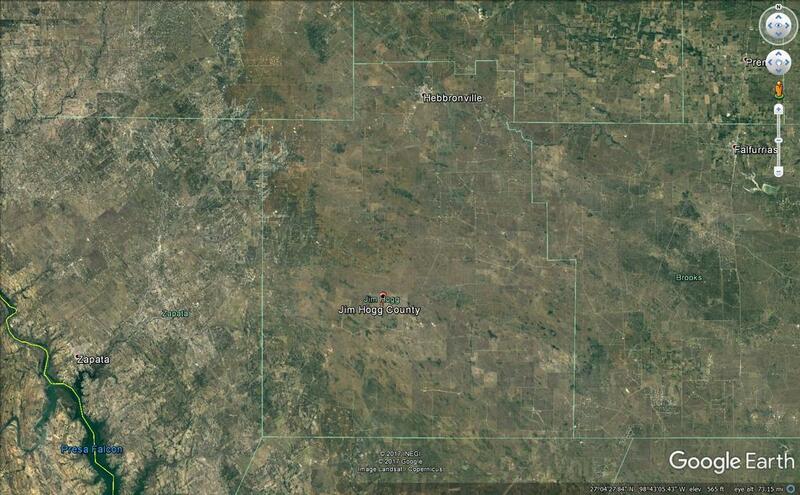 "Between the Texas Revolution and the end of the Mexican War Jim Hogg County lay in the disputed territory between the Rio Grande and the Nueces. 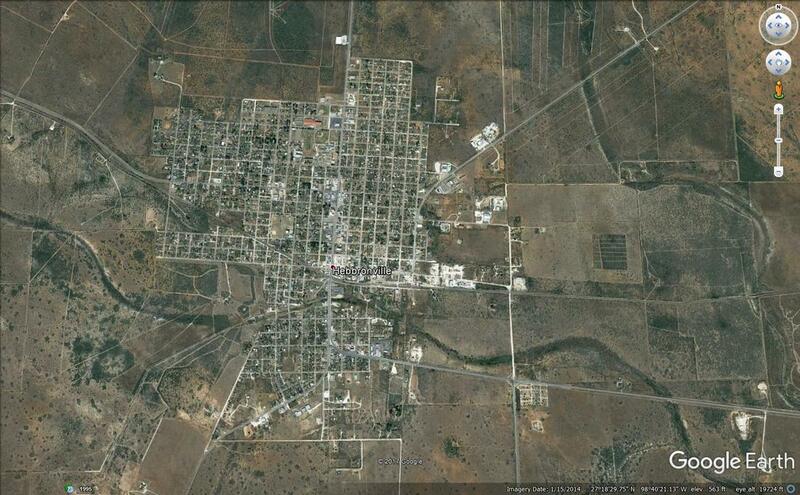 Numerous grantees fled to Mexico to avoid the hostilities. "Initially, the advent of Anglo settlers in the early 1830s did little to alter the region's economic or social character. 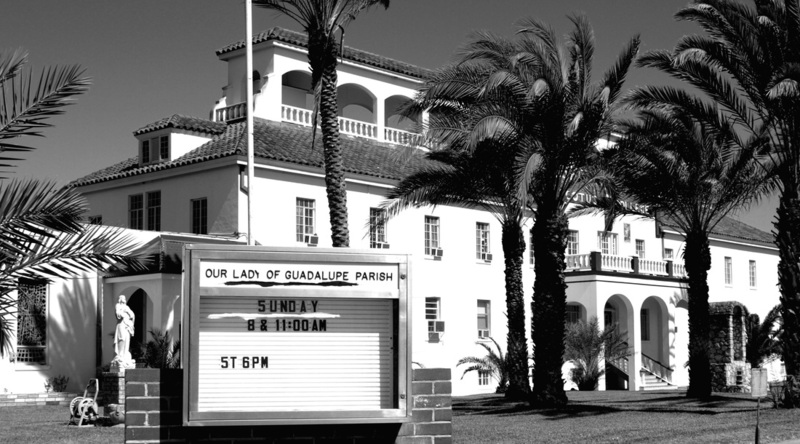 In most cases, the newcomers were integrated into the existing society, either by marriage into wealthy Mexican families or through land purchase. 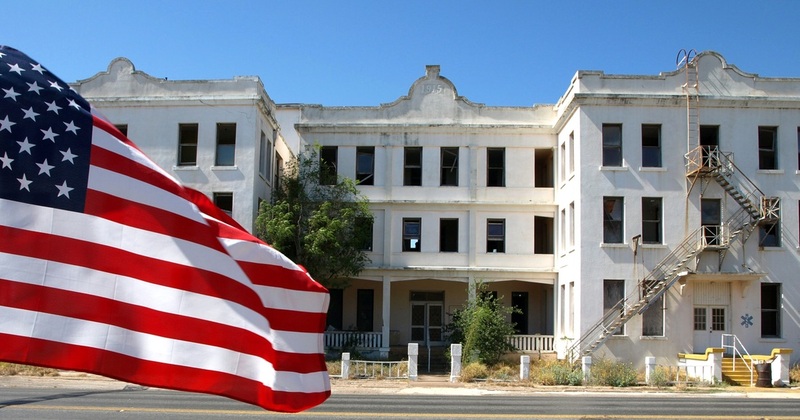 "Immediately after the end of the Mexican War all of the land in the disputed territory was officially made part of the state of Texas. 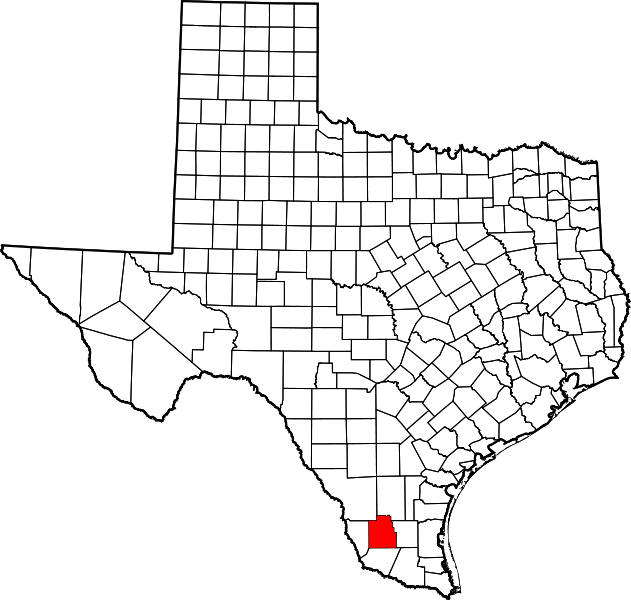 At various times the area that is now known as Jim Hogg County was under the jurisdiction of Brooks, Duval, Starr, Zapata, Live Oak, and Hidalgo counties. 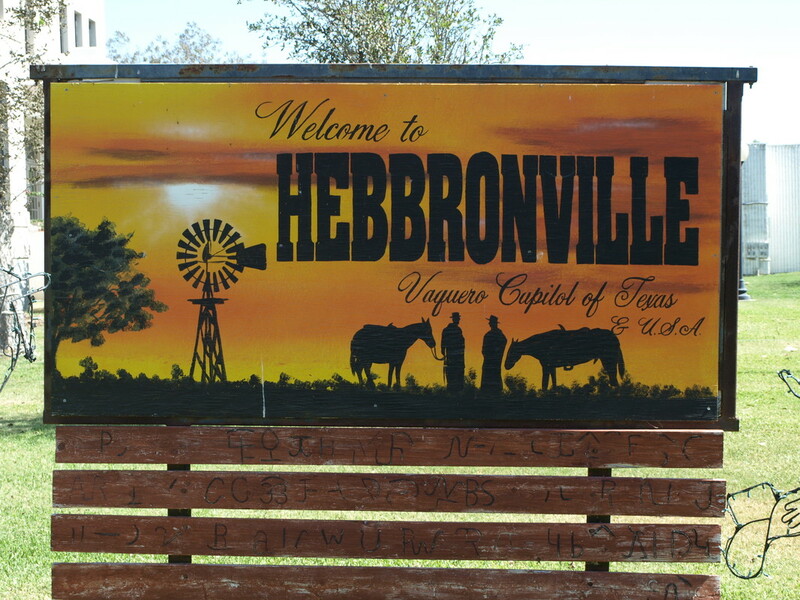 "Jim Hogg County [named for Governor James Stephen Hogg] was formed out of Duval and Brooks counties; land from Duval County was included so that the town of Hebbronville, with its railroad station, could be in the new county." 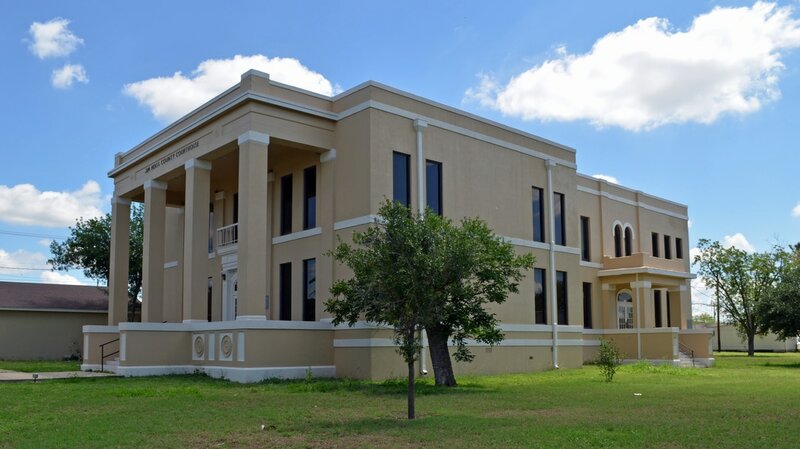 I visited Jim Hogg County and photographed the courthouse in Hebbronville on Thursday, October 27, 2011 and Tuesday, June 6, 2017. 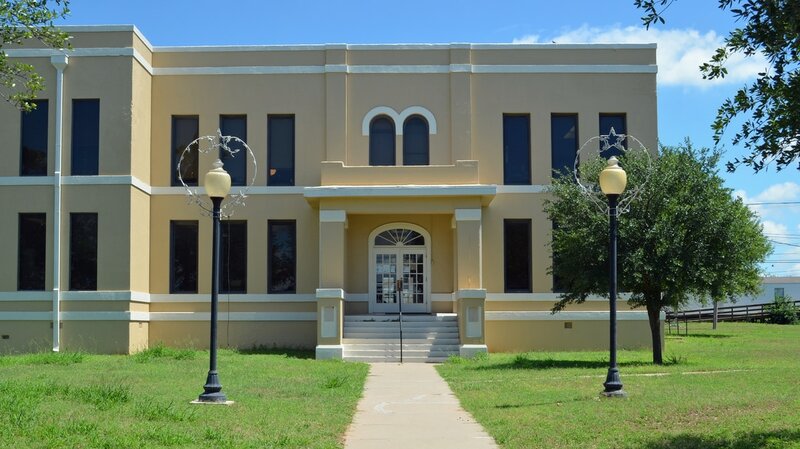 The 1913 Jim Hogg County courthouse was designed by San Antonio architect Henry T. Phelps. The small, 2 story building fronts on E. Tilley Street, on the south side of the courthouse square. 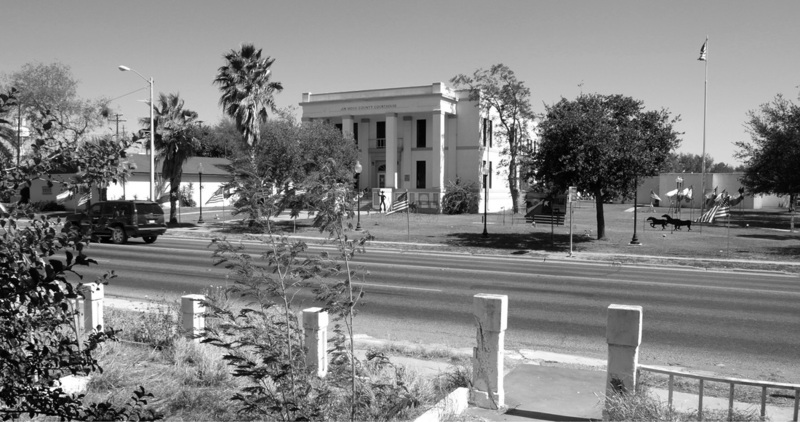 In 1981, a 2 story addition was constructed on the west side of the original courthouse, facing N. Smith Ave. 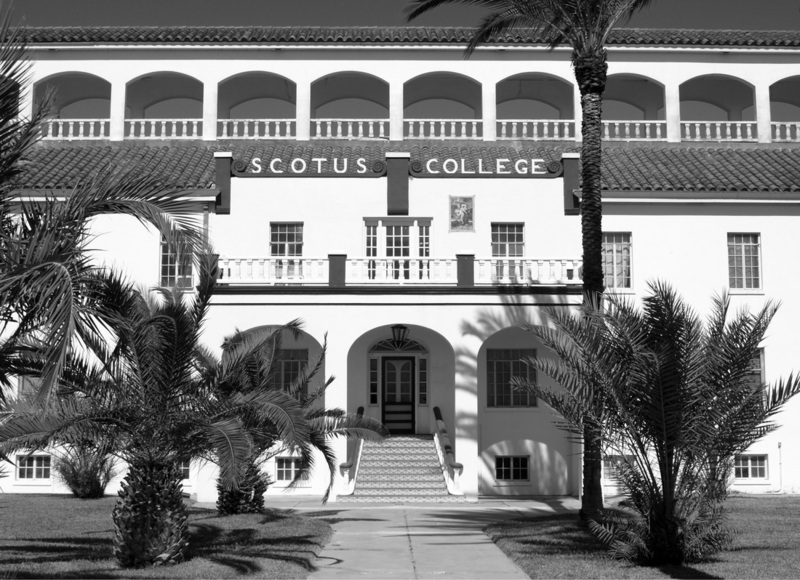 The addition, with a large, double-height porch, became the new "public" face of the courthouse. However, the original 1913 building and its entrance porch stills exists and continues to serve as the everyday entrance to the building. 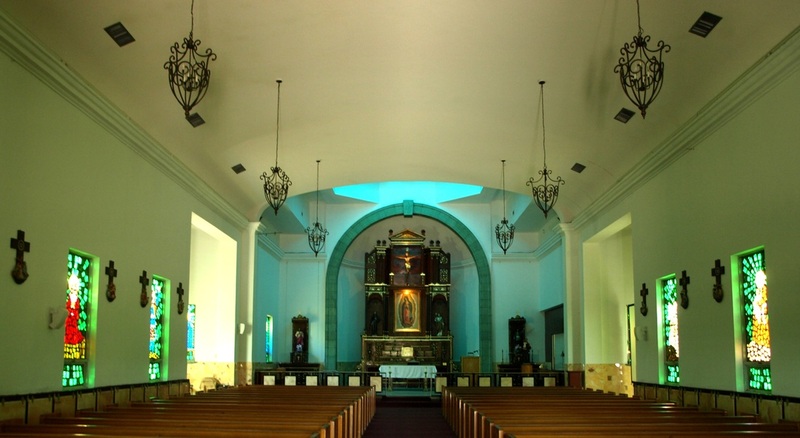 The 1981 addition was designed by Leyendecker & Cavazos Architects of Laredo. 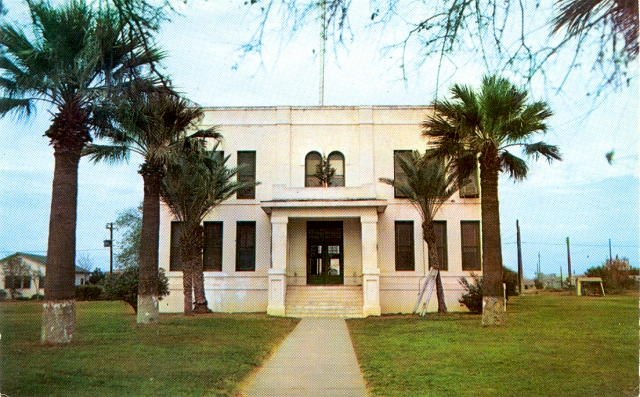 The 1981 courthouse fronts on Highway 16, N. Smith Ave. 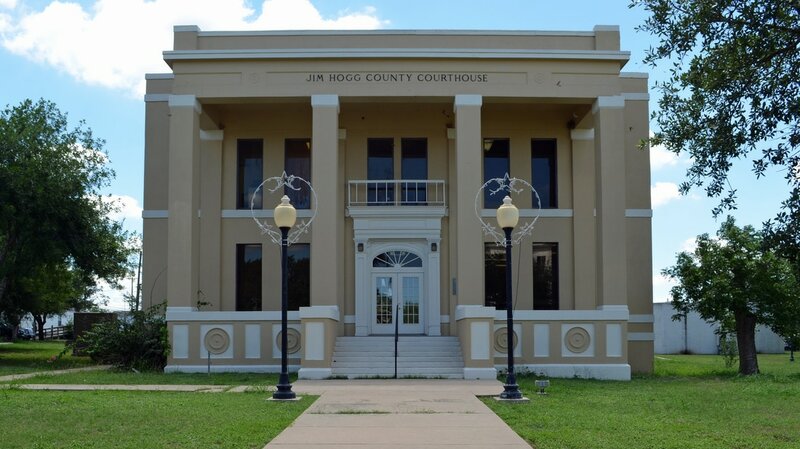 The Jim Hogg Courthouse occupies the center of a block. 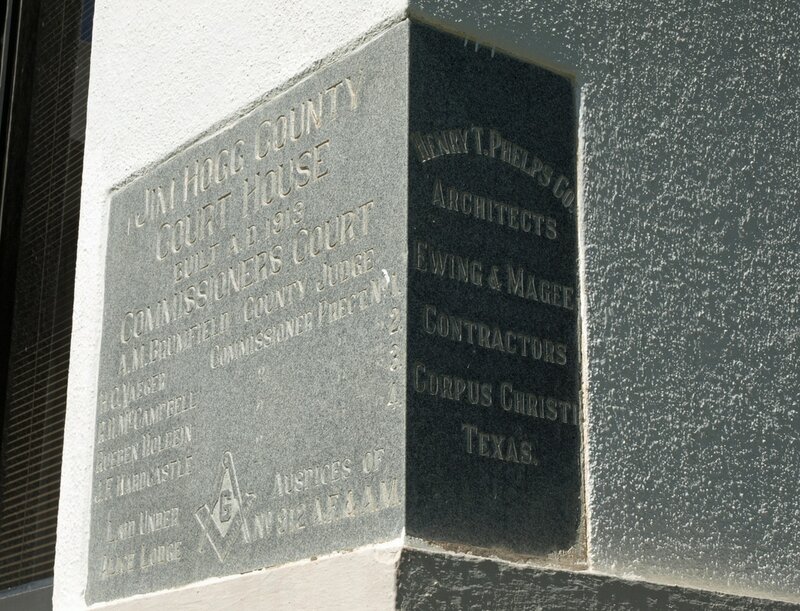 Over time, other buildings have been added to the square, diminishing the physical dominance of the courthouse. 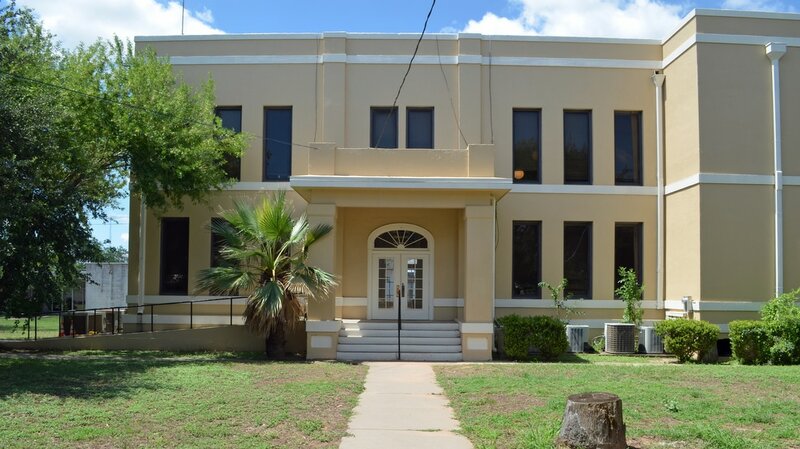 In 1981, a large addition was placed on the west side of the historic courthouse, resulting in a new orientation, to Smith Avenue, the primary artery in Hebbronville. The courthouse was painted sometime between my visit in 2011 and 2017. 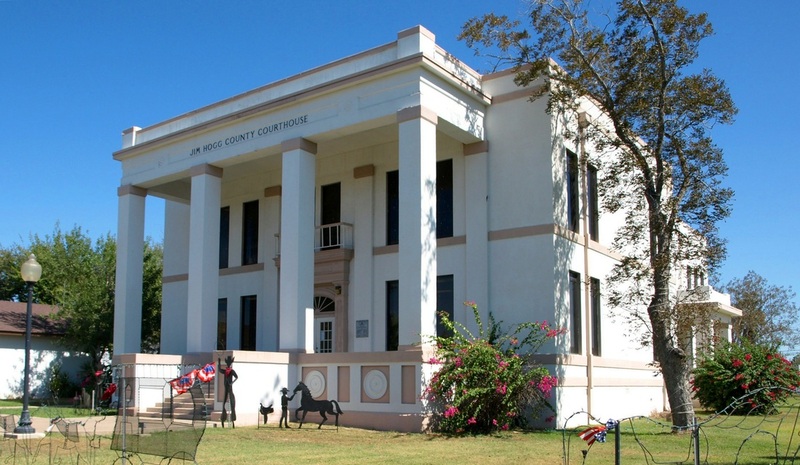 View of the courthouse from the southwest. 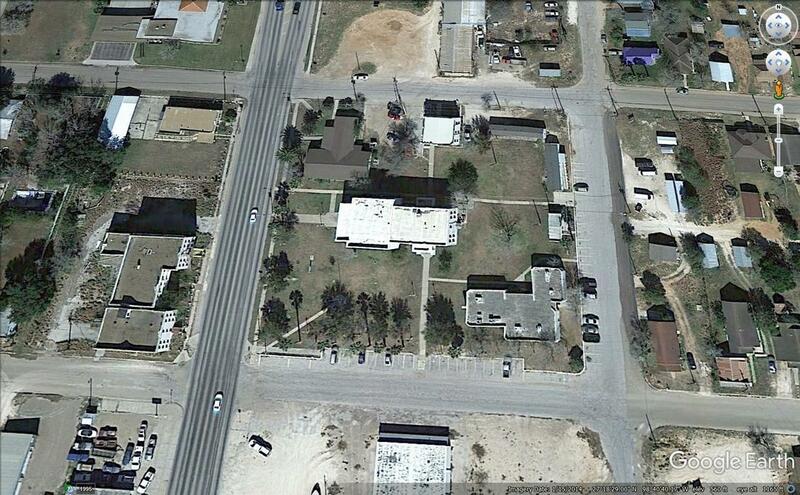 The 1913 building and entrance is on the right. The 1913 courthouse entrance faces south, on Tilley Street. The east facade of the 1913 courthouse. 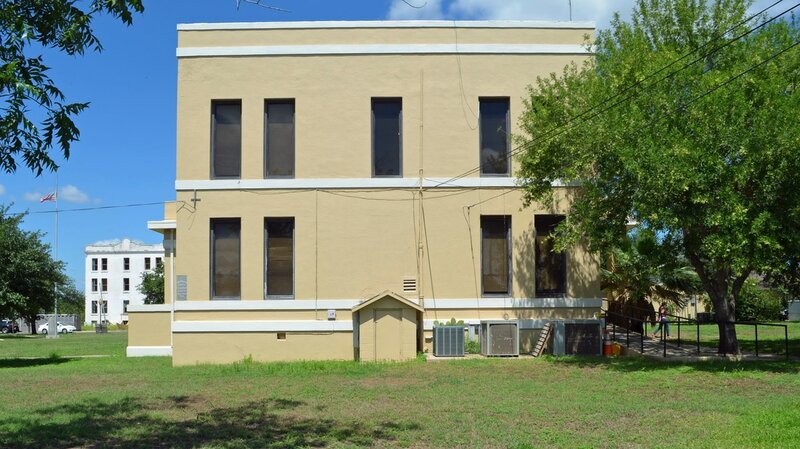 The north facade of the 1913 courthouse. 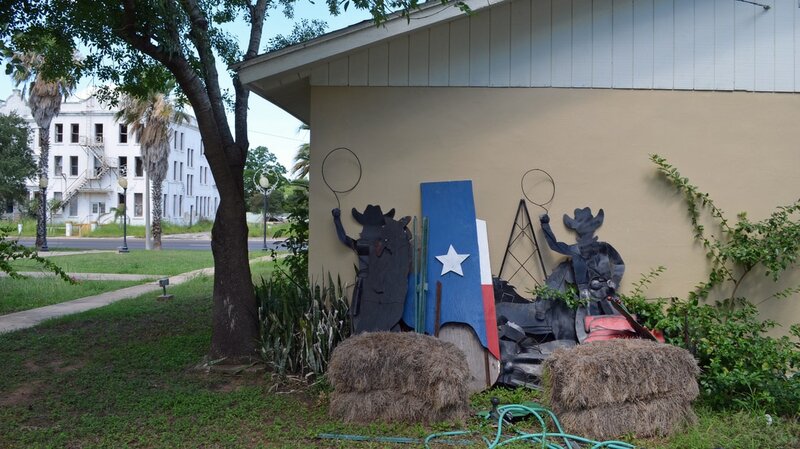 Lawn art stored on the square behind the library building.